I was thoroughly disappointed with the Psychic Force OVA. I discovered it after playing the PS1 game recently. I didn't expect much from it, being an adaptation of a fighting game, but I didn't expect it to go so poorly either. The story is alright at best, after seeing it in full. It focuses too much on the barely fleshed out relationship between two characters and does not get into much detail about the war between psychics and humans. I wasn't really sure what was going on. The OVA also has a tendency to jump between little glimpses of characters, and this is even weird considering that the show is only two episodes. Sometimes we just see a two-second clip with almost no context. Surprisingly there is very little fighting. The art is decent. It looks like you would expect from a 90's anime. There is a lot of blood at times, though it seems almost out of place. I don't think the animation was particularly fantastic in terms of actually animating the characters. I could not stand the sound design. Maybe I just watched a poor quality version, but I found the character voices very annoying. People like to complain about dubbed anime, but this was subbed. As you might expect from a lot of action-oriented anime, there was quite a bit of yelling. Often the characters just yell each other's names. There is not a lot of music either, though the music that is here is good. As mentioned above, I think the characters were barely fleshed out. Of course, with only two episodes to work with, there's only so much that can be done. I expected more than what I got though. I wasn't sure of the antagonists' goals until the very end. Some characters have barely any screen time at all, and some of their actions are still not clear. The character Sonia has a strange backstory in the video game's manual that is not explained at all here. The main character, Burn, has almost nothing to his character except his relationship to the character Keith. It was really a letdown. I did not enjoy watching Psychic Force. I often felt tired. The second episode was much better than the first, which just dragged on and on. Overall I can't give this a very good rating. Everything was disjointed with one-track mind characters and poor sound/script. If you are expecting action you won't find much of that either. I couldn't recommend this much to anyone, as even if you are a fan of the game, it doesn't go into any depth at all. 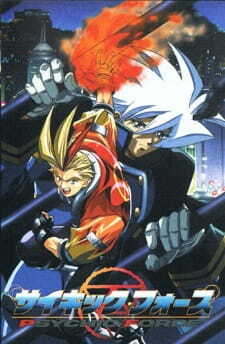 I actually discovered this anime from playing the playstation game years ago and searched it by chance. I was not disapointed with this being one of my favourite fighting games. Following two friends who go their seperate ways Burn promises himself to save Keith. This unravels quickly as it is only a 2 episode series and in addition to this you find out their histories an a little bit about the characters. Theres a little twist or two in there also and I was interested right until the end. The art in this is slightly above average I think but nothing special it's not hard to watch through til the end at all - But could be better. The OP and EP I enjoyed I listened to them through and thought it was a nice song =] As for the BGM it went nicely with what was happening at the time and helped add to the atmosphere of the anime. The characters as a I said before you found out a decent amount about them considering it was a 2 episode anime. There was a fair amount going on for just two episodes and I think this is one of the strong points of the anime. Telling you about the characters pasts, talking about the future intentions, motives and how they feel about things was visible through the anime on a handful of characters which I think was nice for such a short anime.